The Beauty of Life: Beauty Question: What Are Your Beauty Impulse Purchases? Beauty Question: What Are Your Beauty Impulse Purchases? The impulse purchase really doesn't happen for me at the grocery store or the drugstore. I don't find myself needing candy or gum. But step into any beauty store, and chances are I'll have to add on at least something before I check out. The one impulse purchase I always seem to come back to again and again? 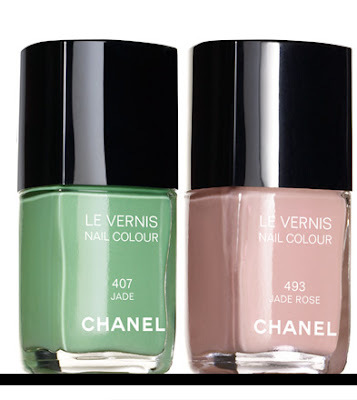 Chanel Le Vernis Nail Colour. I've amassed quite a collection over the years, mainly because every time I walk by a Chanel makeup counter I find myself saying, "Oh, okay, I'll just buy one more." My most recent polish purchase was going to be Chanel Jade Rose, which I actually did end up buying. But just one? No, no, no. I simply had to have Intermezzo too. Oops, fed my polish addiction again! What are your beauty impulse purchases? Let me know in the comments! I have to say my impulse purchases are fragrances. Especially the Pacifica line with the candles. I just LOVE them! Then I go for whatever catches my eye. Do you have the Jade #407? It's sold out everywhere now and I wasn't lucky enough to nab myself one. C'est triste!